Mario Robau, “Jr.” has been dancing for as long as he can remember. Family gatherings in his Cuban community of Houston, Texas always involved dance and, since most husbands were reluctant dancers, Mario routinely took his place whether he wanted or not. He began break dancing at the tender age of eight because “it was cool” and at the age of sixteen, his father introduced him to Swing. 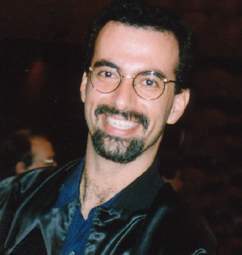 Mario joined the Southwest Whip Club in 1984 and by 1985 he was instructing, judging and choreographing West Coast Swing. In 1988 he began traveling the country, working in various dance circuits, which allowed him to study all forms of Swing dancing with many legends in Lindy, East Coast Swing, West Coast Swing, Whip, Push, Jitterbug, Tulsa Swing, St. Louis Imperial, and Shag. He now travels over fourty weekends a year to teach, compete, judge, emcee, D.J., direct, and of course, dance in both Swing and Country Western events. In his long competitive career, Mario has amassed the impressive list of championship titles in the Swing circuit listed below. He is now the Director of the Novice Invitational and Co-Director of the America’s Classic Swing Dance held in Houston, Texas.